Though players have different allegiances to their respective teams, one thing all players in the NFL can agree on is the importance of community service. In this exclusive to NFLPlayers.com, a handful of players share their thoughts on what service means to them. Read below for soundbites on the value of service directly from these four players. What does community service mean to you? Nadin Khoury, the Upper Darby teenager who gained national attention after being attacked by bullies Jan. 11, will be giving an anti-bullying speech in Washington Friday, with DeSean Jackson’s mother expected in the audience. Khoury and the Eagles wide receiver became friendly after a group of harassers videotaped their torment of the teen, and the video gained national attention. The story gained even more traction when Jackson and fellow Eagles players Todd Herremans and Jamaal Jackson surprised Khoury on The View, offering encouragement. Now Khoury, 14, is set to be an “ambassador” for a proposed educational show called Listen to Our Voices, which is intended to promote an anti-bullying message that organizers hope can air during the school year. “I’m just going to talk about how I turned something from a negative to a positive,” Khoury said. “He’s basically lending his voice to speak up against bullying so that other children don’t have to go through what he went through,” said Joelle Goode, founder and CEO of JMG Productions and executive producer of Listen to Our Voices. 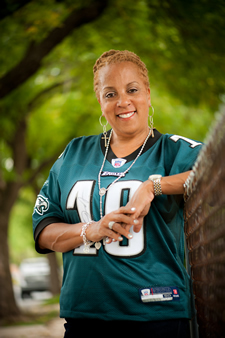 Gayle Jackson, DeSean’s mother, will be in the audience as part of the event. At the launch Friday, Goode plans to screen a trailer for the program, with the hopes of having the full show ready by May or June. As part of the launch event, Goode said she will unveil initiatives that seek to recruit NFL players, celebrities, and players’ mothers to speak out against bullying. 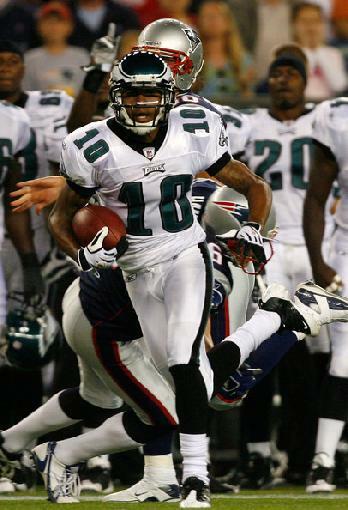 “DeSean’s mom has taken a big lead in that in helping other NFL moms to get involved,” Goode said. The Eagles wide receiver won’t be at the Friday night event, but Goode hoped he could shoot a taped message for Khoury. That aspect is not confirmed yet, though. Khoury and Gayle Jackson have also been working on an anti-bullying public service announcement with North Carolina-based White Light Productions. In the January incident that first gained notoriety, seven attackers dragged Khoury through the snow, stuffed him into a tree and hung him by his coat on an iron fence. One of the bullies recorded video of the harassment on a cellphone. Contact staff writer Jonathan Tamari at 215-854-5214, jtamari@phillynews.com, or @JonathanTamari on Twitter. The Bully Police Squad Founder and National Executive Director to meet with President Obama. The Bully Police Sqaud Founder Karen Wojcikowski and her National Executive Director Debra Gorczynski will be in Washington D. C. for a conference on bullying with President Obama. (PRLog Press Release) September 09, 2011 — – – Pro Bowl receiver Desean Jackson and his mother Gayle Jackson , Albert Harris Jr CEO of White Light Productions, close friend of Albert Harris Jr model Lauren Elliott, Bully Survivor and spokesperson Nadin Khoury, The Bully Police Squad Founder Karen Wojciikowski and National Executive Director Debra Gorczynski will be guests of President Obama for a conference on anti-bullying to be held at the White House September 23, 2011.Whitelight Productions in conjunction with Cinema Classics Inc and Pinnacle Studios have announced that they will begin filming “INNOCENCE LOST.” The filming will start in May 2012 and the film will be in theaters by November 2012. The film is based on the events of Tyler Clementi and Phobe Prince.WhiteLight Productions is also doing the “BULLIED” series, “WRONGFULLY CONVICTED” and anti-bullying PSA’s with The Bully Police Squad, Nadin Khoury and Gayle Jackson.On January 11, 2011, Nadin Khoury, an innocent teenage boy, was brutally attacked by six bullies. These bullies took turns punching and kicking Khoury, who was 13 years old at the time of the incident. After they had injured, terrified, and humiliated Khoury, his bullies left him hanging upside down from a tree. Amid all of this violence, Khoury’s attackers managed to capture the entire horrific experience on video. Later, one of them posted the video on YouTube.While many victims of bullying never fully recover from their experiences, Khoury has made an impressive comeback. When I interviewed him, he informed me that his life has changed for the better. He added, “I go to a wonderful school and I have lots of new friends.” He has found a way to move on with this life. He has started boxing and writing music, for example. Karen Wojcikowsk is President and Founder of The Bully Police Squad. She is a Chicago Police Officer and Public Speaker, I speak on bullying and social cruelty. Also, she is a member of The National Bully Police and a member of the Bully Police National Public Speakers Guild.Debra Gorczynski is the National Executive Director of the Bully Police Squad , she oversees the daily operations of the organization. She advocates for bullied children and makes sure the staff maintains all of the states bullying laws. Alyson Marcy Luftig of konsiderit.blogspot.com will have exclusive behind the scenes pictures and scoop of the event. So, check blog for after the event for a first look on this historic event.The group will be leaving on September 22nd for some filming and be part of the conference with the Obama’s at the White House on September 23, 2011.